Firstly, the speeds of a radio transmitter has become as fast as those offered by wired network technology. Therefore, this makes the performance of outdoor wireless transmission just as powerful as that of wired networks. This solution, which is sometimes more economical, makes it possible to access locations that were previously isolated for you. A.N.S. works with the 3 main providers – Radwin, Fastback and SAF – as well as other producers to give you the best of wireless broadband hardwares. Moreover, you can choose between our wireless point-to-point or point-to-multipoint solutions. However, your choice will depend on the speed and distance you need to reach. Speeds can reach 1 Gbit/s and the max distance is 20 km. In addition, these radio connections exist with or without licences. Radio transmission systems with or without licences? Firstly, the licence-free: your installation uses non-private radio frequencies. Advantage: there is nothing to pay. Disadvantage: on the other hand interference will occur in some cases. Secondly, with licence: your radio installation will be assigned a private frequency. Advantage: a stable link over a longer distance and a guaranteed bandwidth. Disadvantage: while here there is an annual licence fee to pay. Antennas located in the right place! A site survey is essential in order to get projects underway reliably. Therefore, the site survey makes it possible to identify the best design at the lowest cost. 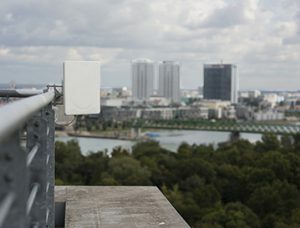 60 GHz (BeNeLux) 500 metres up to 1 Gbit/s!